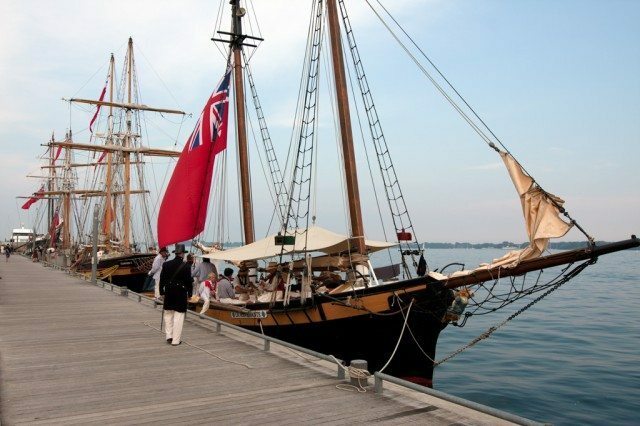 WHAT: Traditional sailing vessels Pathfinder, Playfair, St. Lawrence II, Faire Jeanne, La Revenante, and Caledonian congregated on Toronto’s waterfront Friday night for an open house, before leaving Saturday morning for a War of 1812 commemoration at Niagara-on-the-Lake. Crew members appeared in 1812-era dress and showed off their boats. The fellow in the stylish top hat is Victor Suthern, a writer and historian who served as the squadron’s commodore.